In this post I want to offer some of the silver linings I’ve tweeted or retweeted this year, with attention to the arts, creativity, advocacy, and art therapy. There have been several positive moments, messages, and accomplishments that I have found hopeful and encouraging… some light among the events and challenges 2017 has seen. 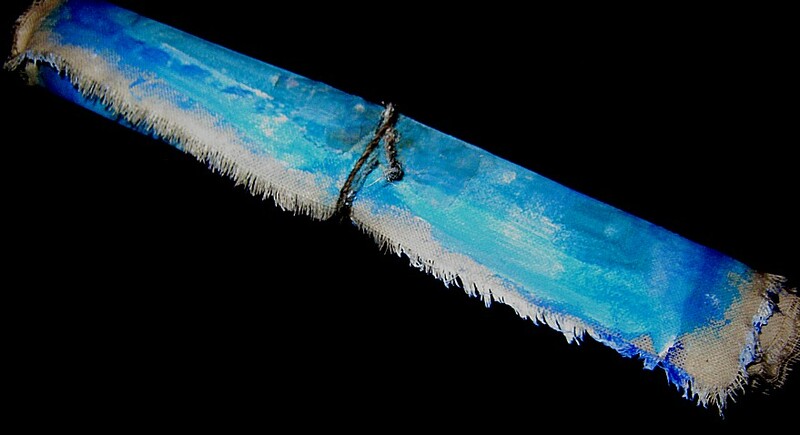 This summer I blogged about the US Department of Arts and Culture’s Guide to Artistic Response to Natural Disasters and Social Emergencies as a creative action resource. Also worth bringing attention to are other opportunities on the USDAC site available for art citizens who want to make a social impact with their creative expression. The next event happening is the People’s State of the Union, an annual civic ritual and participatory art project if you are interested in getting involved! Art Therapist Lani Gerity’s 2017 blog posts (#157-#171) Out of A Thousand Ways to Have a Happy Artist’s Life series has also highlighted much needed reminders about how the arts, creativity, and imagination can be used to help us be more resilient, kinder, and peaceful when facing dark and unsettling times. I wish you a 2018 full of artful abundance and creative spirit…. Happy New Year to you and yours! Social media is a powerful tool for self expression and engagement of all kinds…giving a voice for many and often a way to cast attention, influence, and respond to causes, values, and efforts we hold dear or reject. Below are some links I have been reading, saving, and sharing from and on social media recently. Most are rooted in self-care, individual influence and responsibility, and creative community action through the arts. Many offer ways we can effectively activate resources, ideas, and our gifts both on and offline with others (and ourselves) as artists, creatives, mental health professionals, helpers, and human beings. Recently I attended a retreat where part of the day introduced a closer look at the meaning behind mission statements. A mission statement offers intention and guidance towards ones goals and potential, often empowered by important values and beliefs. A common practice in organizations and companies is to have a mission statement that helps define and offer focus about what the organization does, its purpose, and values. Also introduced as a component of self-care during this retreat, mission statements can also be created as a personal declaration that helps define meaning, intentional living, and our own values that guide and empower our work, life, and goals. It also helps strengthen resilience and compassion satisfaction, especially important for combatting compassion fatigue, vicarious traumatization, and burnout. After reflecting on this practice more, I was inspired to create a mission statement collage to explore this idea deeper. Before crafting the collage I used a provided template inspired by the work of Covey, Merrill, & Merrill (1997) that offered a series of “it is my mission to” prompts. I also discovered there are a lot of mission statement generators and builders online if you want additional help! 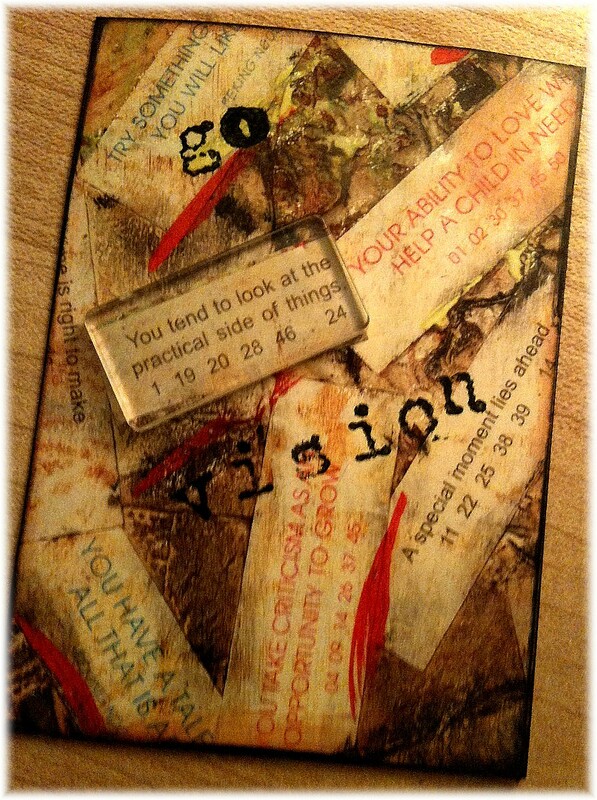 Creating this collage also will serve as a visual reminder to continue reflect on and refine. 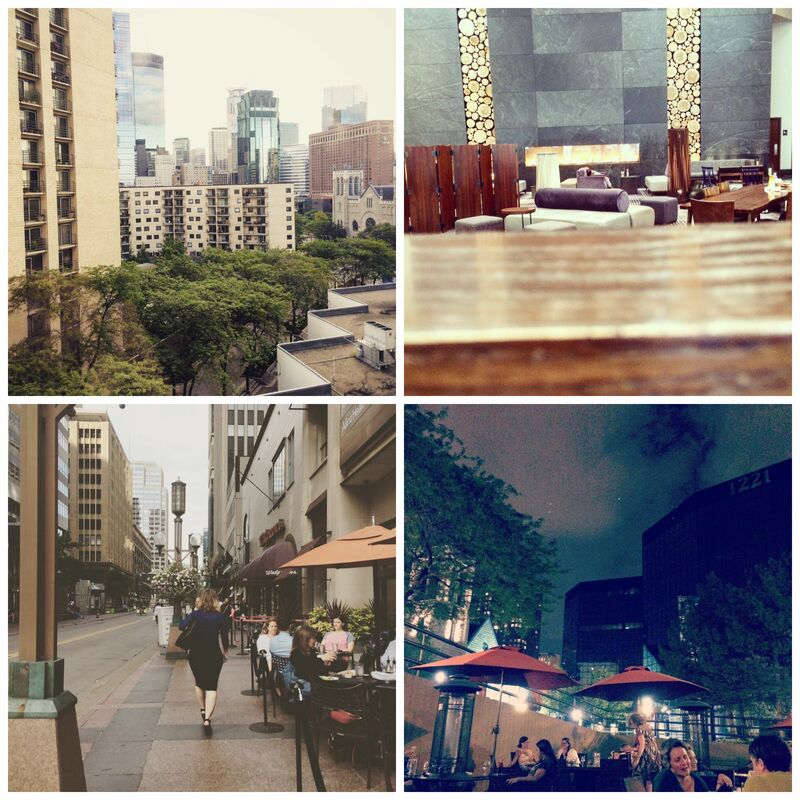 It’s taken me a couple of weeks to decompress and get into gear again after attending the 2015 American Art Therapy Association Conference in Minneapolis, but I wanted to share some of the memorable moments from the week– it was a schedule full of learning, presenting, re-connecting, meeting new faces, & inspiration that was well spent. 1. 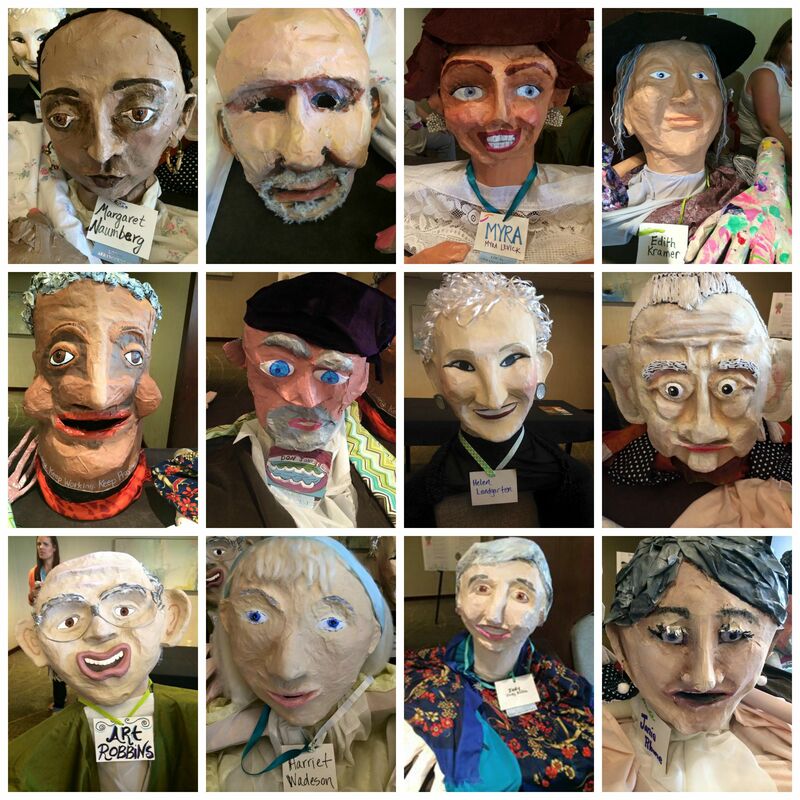 The Art Therapy Parade of awesome pioneer and inspiring art therapists that was creatively handcrafted by the Local Arrangements Committee for the Opening Session. Wow– this was great! 2. 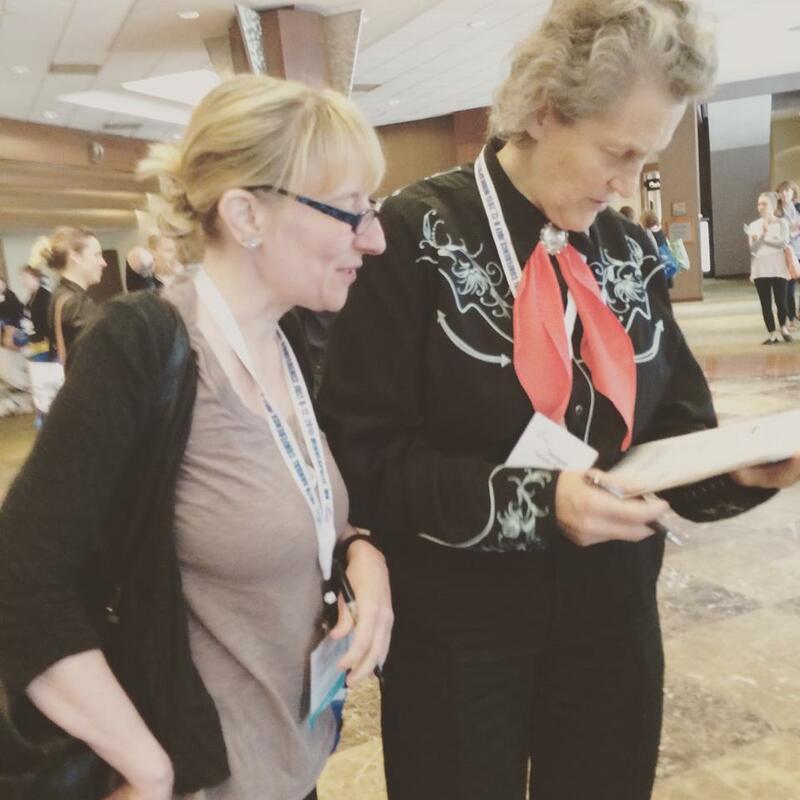 Temple Grandin’s Keynote on neurobiological functioning & information processing. Dr. Grandin offered an inspiring lecture highlighting the sensory based value of art-making & creative expression with visual and “bottom up” thinking- and its unique role in helping make sense of information and experiences. 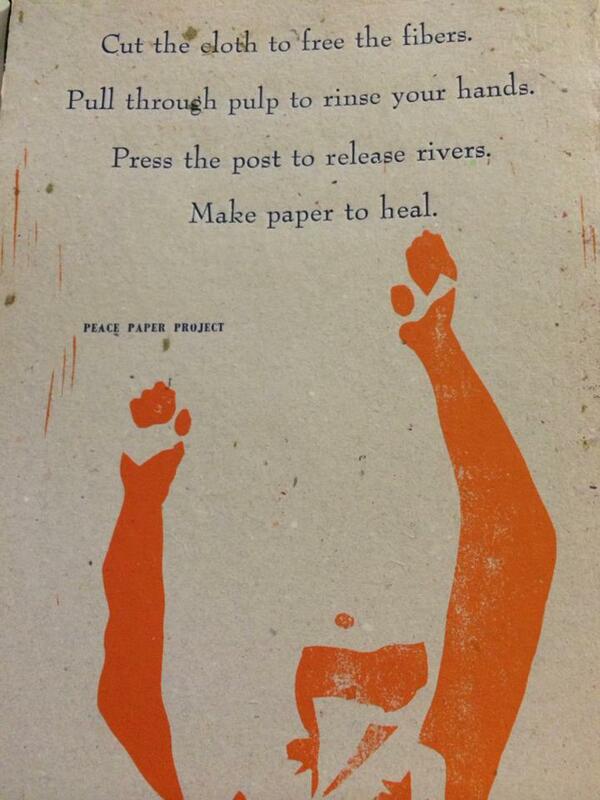 Learn more here from her book “Thinking in Pictures”. Really enjoyed the opportunity to meet Dr. Grandin as well! 3. So many great educational sessions to take in, not enough time to see everything! Honorable mentions include the Edith Kramer Legacy and Decolonizing Art Therapy: Social Justice & New Paradigms of Care Plenaries. 4. 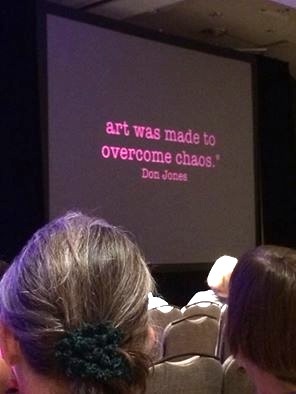 Tribute to Don Jones with Art is Life is Art by Bruce Moon- Earlier in 2015, the art therapy community mourned the passing of Buckeye Art Therapy Association Founder and all around amazing art therapy pioneer Don Jones. During the AATA conference there were special moments to celebrate Don’s life and important contributions to the field, which also included being one of AATA’s co-founders and early President. Highlights from Art is Life is Art reviewing Don’s life was a beautiful and heartfelt tribute to Don’s spirit, life, and work among a community of friends & colleagues who miss and cherish him so much! 5. 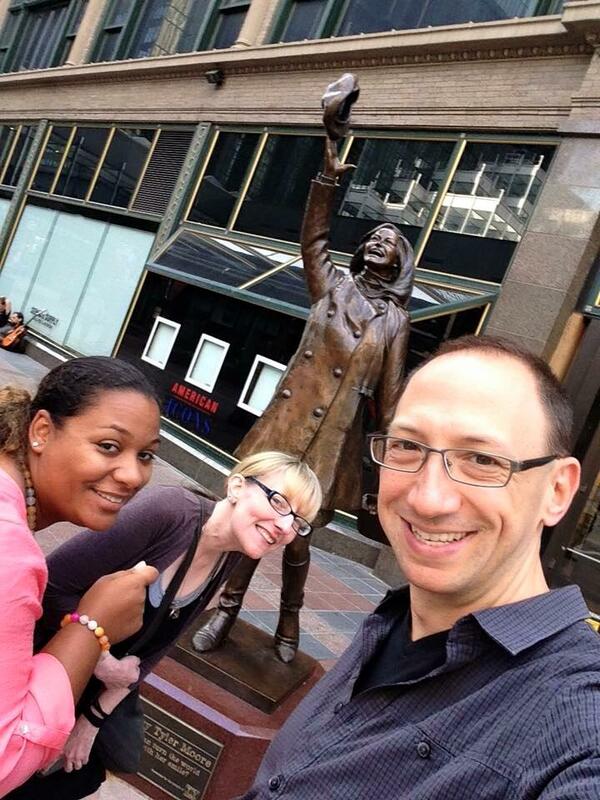 Mary Tyler Moore Statue- An offsite break to Minneapolis’ Mary Tyler Moore Statue was a must go to site after a day of conference attending- only a few blocks away. 6. 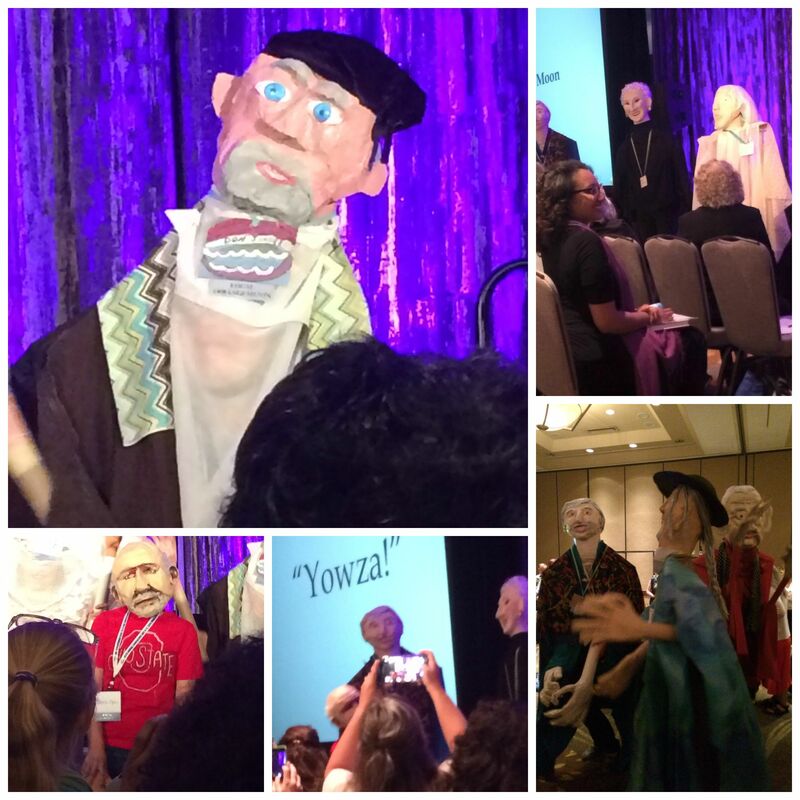 #AATA2015 photos with friends & colleagues and following conference live tweeting and activity on social media. 7. 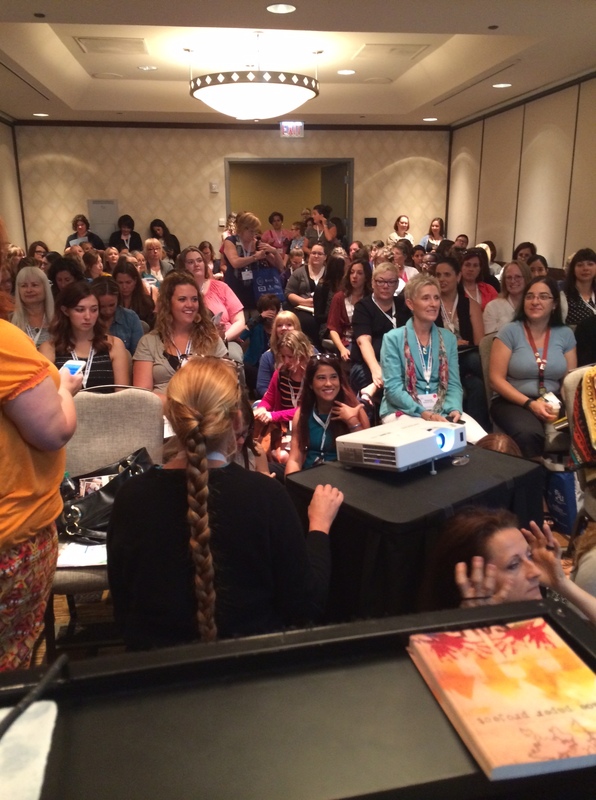 Standing room only @ our paper making panel about trauma & transformation and work with Peace Paper- Many thanks to everyone who was able to attend and to my panel colleagues! 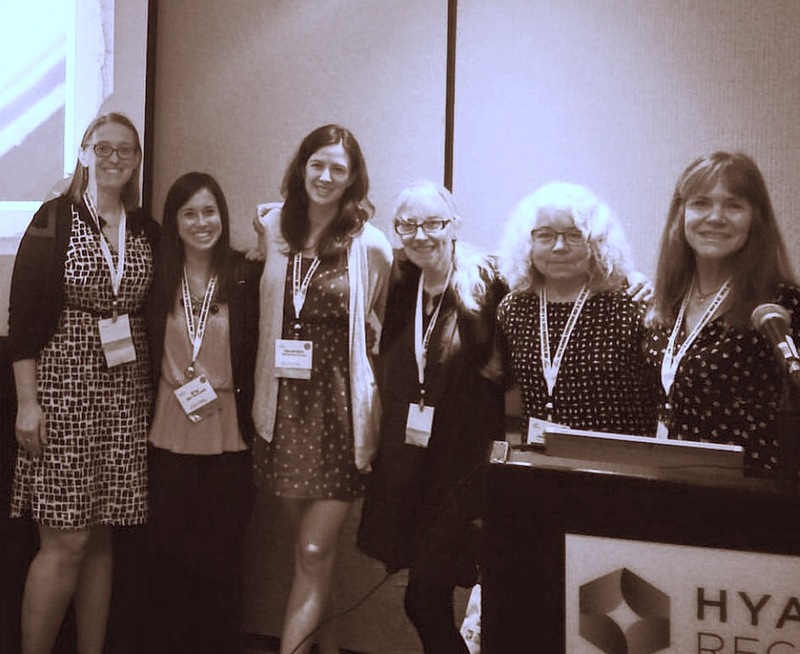 It was great to share our experiences and the therapeutic uses of paper making as part of the conference program– and see all the interest in this process! Thank you to Drew & Margaret who gifted us with hundreds of sheets of limited edition handmade paper especially made for conference attendees to take home with them. 10. Time to Refresh & Renew- Spending time in presentations, making art, meeting up with friends & colleagues, as well as making new connections and taking in all things art therapy was great to be around on many levels. All the collective work and service that continues to be done on behalf of art therapy is inspiring to take in and be a part of. I chose the fortune cookie background because sometimes I feel like the collages I create have something to communicate about the future, but I might not always understand (or ready for) the message in the here and now. This week marks an important transition related to finishing my second term as President of Ohio’s Buckeye Art Therapy Association (BATA). Back in December 2009 when I was starting to create my 2010 revo’lution, I knew this moment to-be was going to be an important piece to this year’s events in my professional life. And now the moment is here. 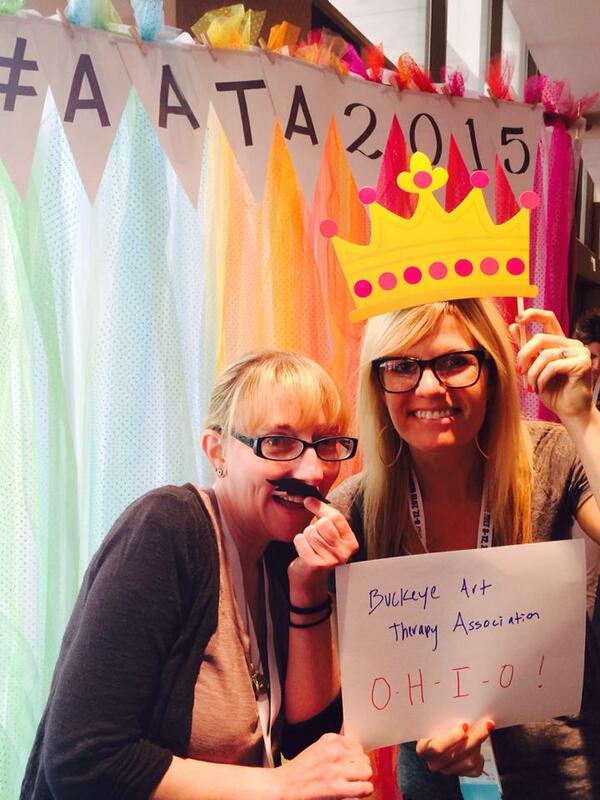 As my tenure as BATA’s President comes to a close, I am most proud of the hard work that has been done related to increasing BATA’s membership, Symposium attendance, creating more financial stability, enhancing BATA’s web presence and resources/tools on-line, as well as cultivating service, leadership, and advocacy in the Ohio art therapy community. I am not only grateful to members of BATA for their support and entrusting me to lead this Association throughout these last few years, but I also have tremendous appreciation for the BATA Board of Directors I have served with for their help to make the above successes happen. I am thankful for their commitment to BATA and assisting this organization to continue on as one of the largest and most active state art therapy associations in the country. This coming Saturday will be our final board meeting together and a time to pass the leadership torch onto the 2011-2012 BATA Board of Directors. To express my appreciation of their service, support, and help, I created gratitude scrolls for each board member to receive at our last meeting. 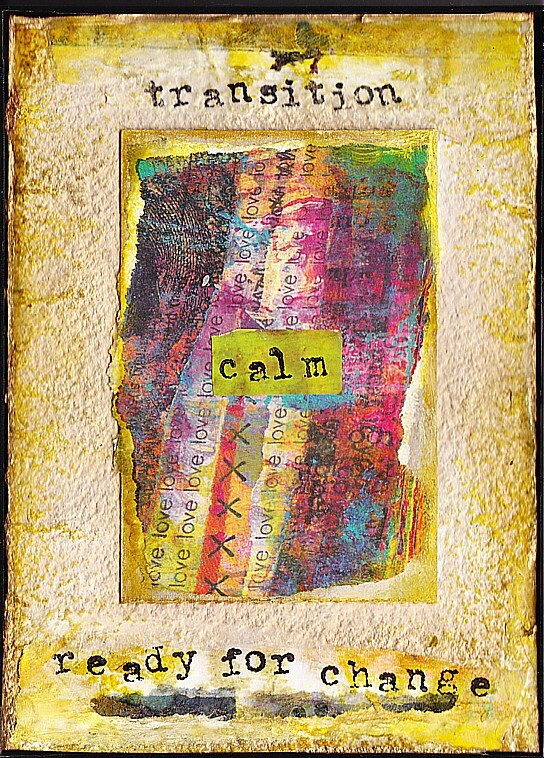 This idea was inspired by Leilani Pierson’s pocket scrolls featured in the July/August issue of Cloth Paper Scissors and a gratitude project that Cathy Malchiodi introduced in her Courageous Creativity course taught at this year’s Prescott College Expressive Art Therapy Summer Institute. 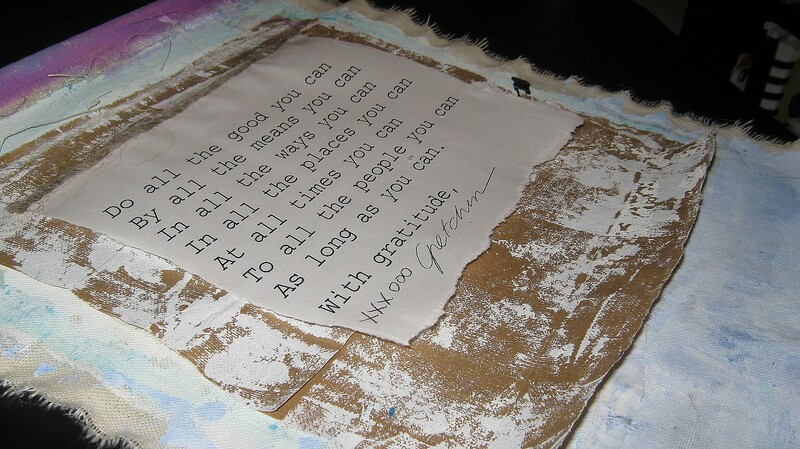 These scrolls were created from pieces of canvas that were sewn, gessoed, painted, stamped, embellished with trinket pins and wire, as well as included layered messages of thankfulness and gratitude that will be rolled up inside. During my six years involved with the BATA Board of Directors, I definitely have a new appreciation for leadership’s bigger picture and the teamwork success requires, I have also learned important lessons about service that have contributed to strengthening my future purpose and intention about how I can continue to serve the art therapy community. Looking forward, I am excited to focus more of my time to Art Therapy Without Borders, Inc. and the communities of The Art Therapy Alliance and International Art Therapy Organization to help promote, develop, and support art therapy initiatives and the work of art therapists worldwide. Best wishes to BATA’s new leadership and continuing the important mission of advancing art therapy in Ohio. Autobiographical Information: Learn more about my work as a Registered Board Certified Art Therapist and Certified Trauma Consultant, my educational training, clinical experience and specializations, interests, as well as professional affiliations with organizations such as The Combat Paper Project, The National Institute for Trauma and Loss in Children, and community organizing with The Art Therapy Alliance and Art Therapy Without Borders, Inc.
Information and Resources About Art Therapy– Learn more about what art therapy is and what art therapists do, including definitions, resources, and links from organizations such as The Art Therapy Alliance, International Art Therapy Organization, Art Therapy Without Borders, The Buckeye Art Therapy Association, and The Art Therapy Credentials Board, Inc.
Services– Learn more about art therapy services that I provide in the Greater Cleveland, Ohio area, which includes working with agencies and organizations serving traumatized and grieving children, adolescents, and families who have experienced illness, loss, and family violence. Other services highlighted include art therapist supervision, providing art therapy workshops and professional continuing education for agencies, schools, and community groups. On the Grid– Information about my love and passion related to art therapy and technology, including blogging, on-line art therapy communities, podcasts featuring my work and interests, and the art therapy e-zine FUSION. Presentations– View some of my SlideShare presentations about art therapy with children from homes of domestic violence, working with youth coping with grief and loss, as well as the impact of Bruce Perry’s work on my practice as an art therapist and trauma specialist working with traumatized youth. 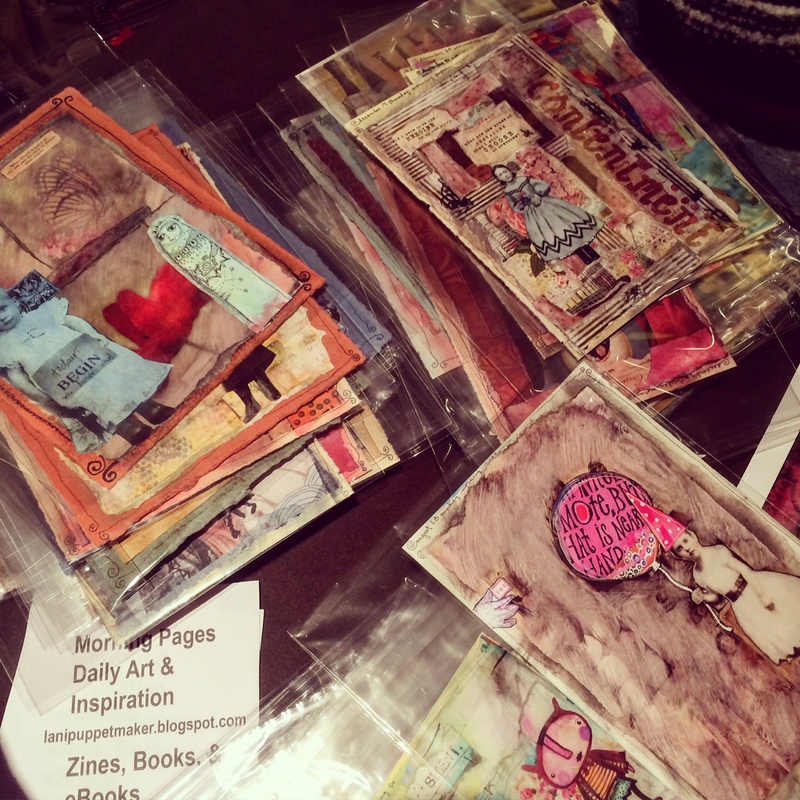 Film/Art Gallery– Watch some of my favorite short videos and films featuring my collage art, altered books, community art events, and initiatives of The Art Therapy Alliance and Art Therapy Without Borders, Inc. The BATA Symposium is quickly approaching! The registration for The Making of Mindfulness through Art has received a strong response, with over 140 art therapists, art therapy students, and interested professionals coming from not only across Ohio, but also several states and Canada. I am looking forward to seeing everyone in Columbus next week! It’s planning and preparation time again for this year’s Buckeye Art Therapy Association’s Annual Symposium to be held September 24-25, 2010 in Dublin, Ohio. This year’s theme, The Making of Mindfulness through Art, will include two days of workshops and presentation offerings highlighting the use of art therapy in the practice of mindfulness, meditation, and Dialectical Behavioral Therapy (DBT). The Symposium Program will also be premiering ART IS LIFE IS ART: The Life and Work of Don Jones, a documentary by Bruce L. Moon that examines of the extraordinary life and work of BATA and AATA Founder Don Jones. BATA’s Symposium keynote will be Michael Franklin, Ph.D., ATR-BC, who directed the undergraduate art therapy program at Bowling Green State University from 1986 to 1997 and introduced the field to me as my first art therapy professor. Dr. Franklin is currently a core faculty for Naropa University’s Transpersonal Counseling Psychology Department and Director of Naropa’s Graduate Art Therapy Program in Boulder, Colorado. There’s still time to get your registration in if you would like to attend this year’s Symposium and enjoy a little mindfulness and art therapy! The mail in registration deadline is September 7, 2010. On Day 2 of the Symposium, Cathy Malchiodi and I will be teaming up again to present Papermaking as Self Reclamation and Transformation: Deconstruction to Reconstruction. This presentation will provide an overview about how papermaking can be a transformative, mindful, and reparative process that facilitates and enhances exploration of personal meaning. 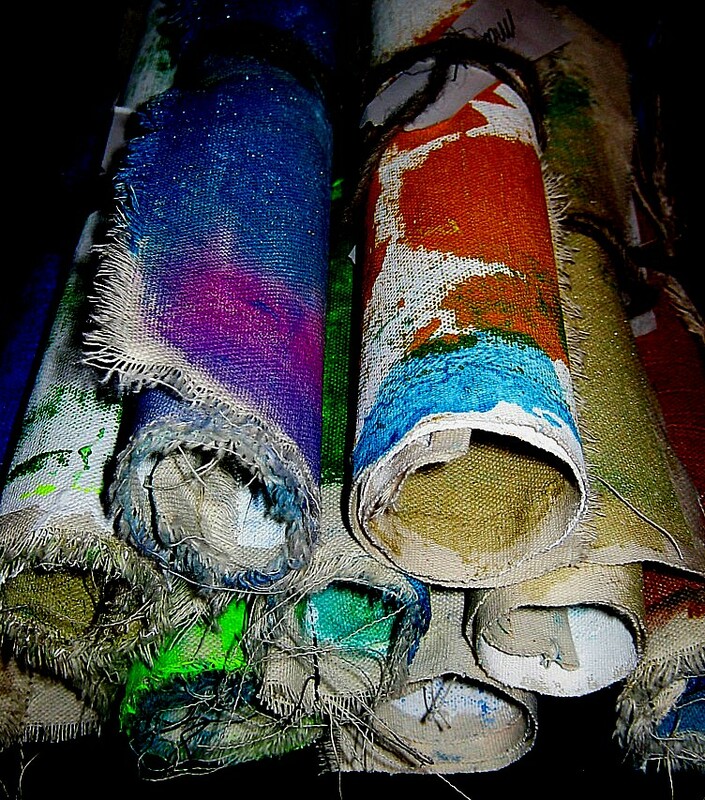 The basics of papermaking as an art therapy approach through practical applications and first person experiences will be explored, as well as highlighting The Combat Paper Project and suggestions for art therapy’s role with returning military. 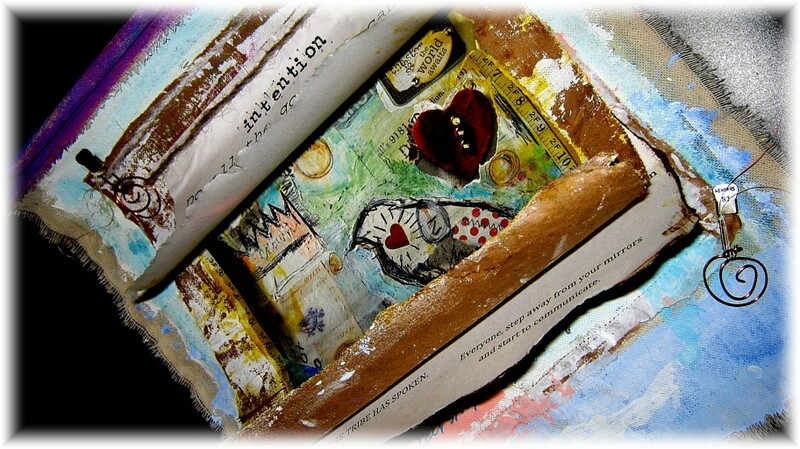 In connection with this presentation, I have been working on my own handmade book that chronicles some significant experiences and crossroads in my professional life over the last few years. 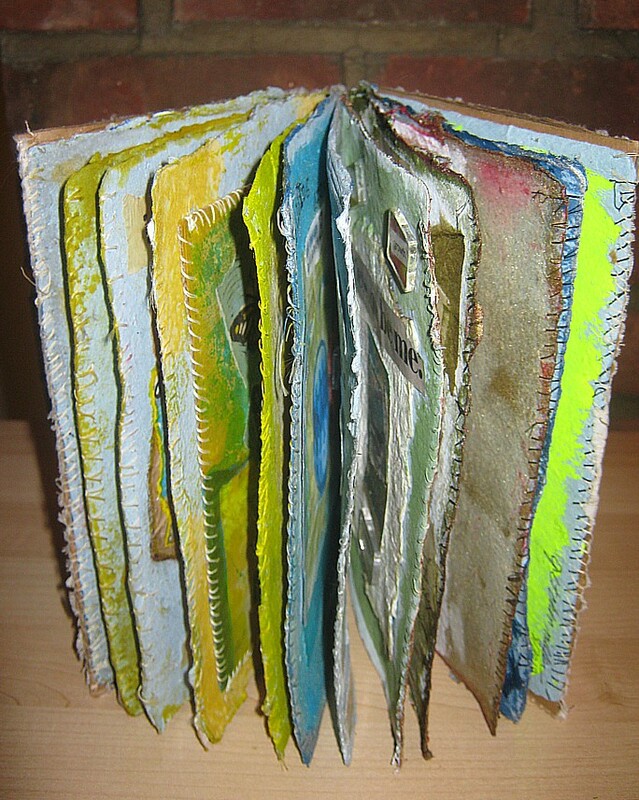 The paper that was made to create the pages of this book came from unwanted personal material and content that was shredded, pulped, re-transformed into new sheets of paper, and then liberated into new life and meaning for this project. I’m really looking forward to sharing some of my personal experience and the art created for this book!